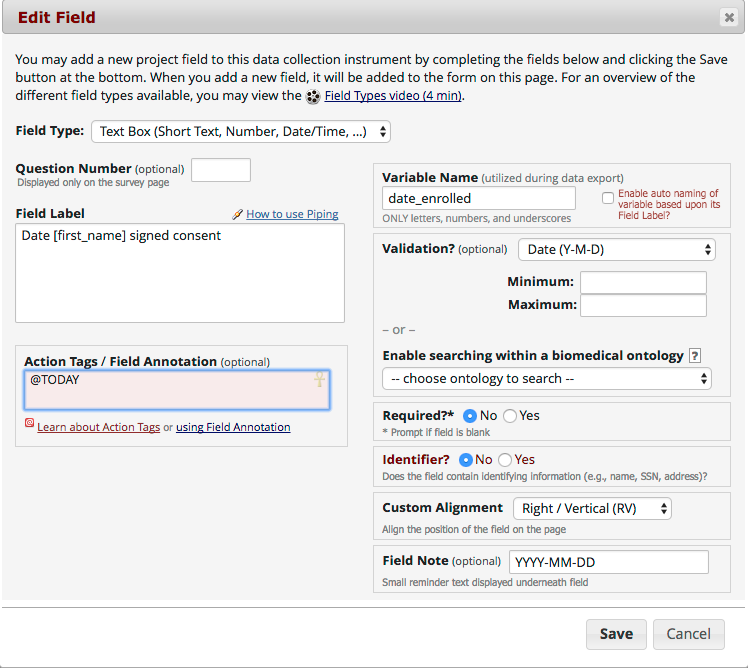 Posted on February 16, 2018 by Rob P.
Have you ever wondered how to include an automatic time stamp as part of your official REDCap data set? Consider using either the @NOW or the @TODAY action tags. When @TODAY is applied to a text field, REDCap will automatically track the date in which the survey was opened and record the data to that field. For @NOW, REDCap will record the date and time. Note, when a survey participant opens the form, REDCap records the local time on that device, so there may be variation depending on the time zone. To add either of these action tags, type “@NOW” or “@TODAY” in the action tag box. In order to apply the @NOW and @TODAY, validation type is needed. Action Tag @NOW must have a validation type that includes both the time and date, for example with the term “datetime” in the title. For @TODAY, the validation type only needs to include the date. These two action tags can only be used in text fields. The @NOW and @TODAY action tags are mutually exclusive, but each of them can be individually combined with other action tags like @HIDDEN or @READ-ONLY.